Hyderabad, July 04, 2018: Dhanuka Agritech Limited, India’s leading agrochemicals company, has won the ASSOCHAM Water Management Excellence Award 2018 in the ‘Excellence in the field of water education and awareness’ category. The company has been awarded for promoting water conservation for farmers/villages at various levels. Recognizing the impending scarcity of water nearly a decade ago, the company has been educating and spreading awareness on water conservation. This year the company organized a national-level summit on water sustenance. 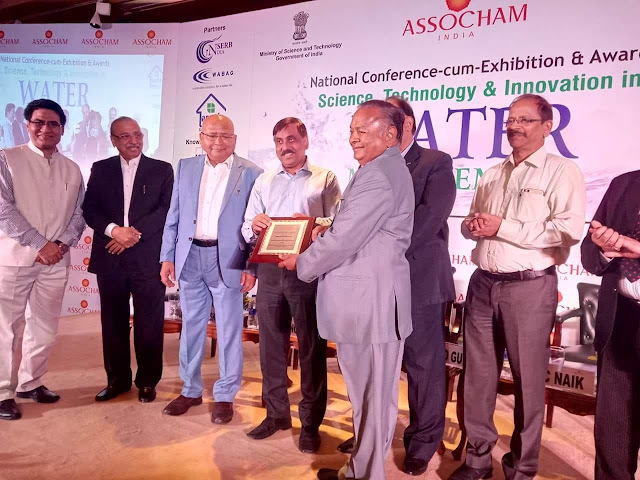 Mr R. G Agarwal Chairman Dhanuka Agritech receiving award from ASSOCHAM. Dhanuka’s flagship campaign ‘Khet ka pani khet mein aur gaon ka pani gaon mein’ is now more than a decade old, under which it has undertaken multiple initiatives to popularize water conservation practices. Every year, the company celebrates World Water Day in partnership with prestigious National Institutes and State Agricultural Universities and organizes educative lecturers by industry leaders on water conservation. Further, more than 1,100 field staff organize farmers’ meetings across the country, educating them on water conservation in the field, and also organize multiple activities in schools across India. The activities are designed to raise awareness about the importance of water conservation among children. To conserve rainwater, the company has funded the construction of check dams at Jugalpura, Devipura (District Sikar), Mainpura ki Dhani and Sankotra, (Jaipur district), Rajasthan, which are now fully operational and have been filled with rainwater. The company is also implementing various water harvesting units in various parts of Rajasthan so that farmers have access to water for irrigation. In addition, Dhanuka had made a ‘community water centre’ in Banethi Village in Rajasthan for providing fluoride-free safe drinking water to people. The company strongly supports the government’s agenda for water conservation for irrigation and promotes ‘Pradhan Mantri Krishi Sinchai Yojana’ for enhanced water efficiency through `Per Drop More Crop’. M/s Dhanuka Agritech Limited manufactures a wide range of farm input products to support the farmers in their pursuit for better crop, better farming and a better life. The Company has a pan-India presence through its marketing offices in all major states & 4 manufacturing unit in India, with a network of more than 7,500 distributors, 1500 skilled employees selling to approx. 80,000 retailers across India and reaching out to more than 10 million farmers. We have world class NABL Accredited Laboratories. The Company has technical tie-ups with 4 American and 6 Japanese companies. Dhanuka Agritech is among the top five companies in India, in Brand sales. With more than 200 registrations and/ 350 active SKUs, the company has one of the largest market penetrations. Dhanuka Agritech currently has 30 Branch offices across India and 48 warehouses. Dhanuka is a preferred Brand among progressive farmers. Growth drivers are the intensive marketing network penetrating even the interiors of India, increased farm income, enhanced awareness about the cost-benefit ratio of agro-chemicals, highly diverse product range with solutions for almost all problems in all crops, innovative marketing strategies and international technical tie-ups. The company is working towards farmer welfare by strengthening Agri-inputs dealer as a strong extension service provider for that our DEASI program in association with many Agriculture universities stabling new milestone. The Company keeps adding new products every year through its collaborations and is continuously on the lookout to bring the latest technology to Indian Farmers. Personal Finance : What is Rule 72?